Trials Rising is the thing that keeps you up at night. Trials Rising is the thought that will cross your mind when you’re at a bar with friends, your mind adrift somewhere else. Trials Rising is the adrenaline you can’t seem to quit, like your third cup of coffee of the day. Trials Rising is the stress that your doctor advises against. When you’re playing Trials Rising, it’s all that’s on your mind. You race tracks over and over with a motorbike controlled by minute tilts of the analog stick, repeating from checkpoints or starting the entire race over with the tap of a button. The routine is natural: fail, fail, fail, fail, and finally succeed. When playing, everything else fades away; whether it’s Rising’s own limited and mostly bad licensed music, or the friends you’re on Discord with. And when you’re away from the 2.5d motorbike racer, it comes back to haunt you; that pesky electric fence that you always crash into the first go-around on Alcatraz, or the Contract challenge that bids you to land a staggering 14 frontflips on a single run with hardly any quick restarts. 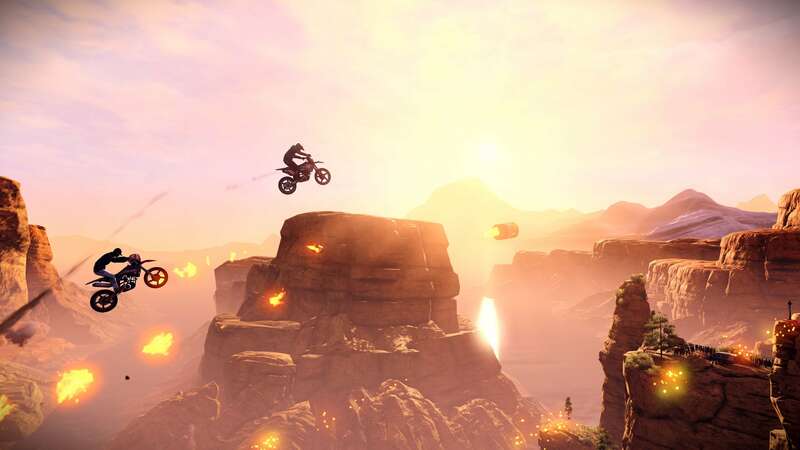 Trials Rising is, put simply, more Trials. For Trials fans, that’s a good thing. You race across levels. Sometimes just to beat a high score. Sometimes to chase after a Gold, Platinum, or Diamond medal. Sometimes to complete a new task all together: a Contract. With the new Contracts system, old levels you may have already gotten a Gold or Platinum on are suddenly made appealing again with new challenges. The Contracts vary in difficulty, just as the levels do, and get progressively harder and varied depending on what sponsor is bidding the contract. (For instance, the motocross brand Fox’s Contracts have a fascination with doing hella flips, and so on.) The rewards are better for completing Contracts rather than just playing through any old level again, with cosmetics, stickers, as well as large doses of Fame (Trials Rising’s XP) and Trials Coins awaiting. When Trials Rising is Trials, it is the same addictive rush; with the replays on replays keeping you glued until the wee hours of the morning. It’s the path to get there that’s more annoying. Unlike the futuristic finesse of immediate predecessor Trials Fusion, Trials Rising operates across our familiar world. You’re on an international tour, barreling across world-famous landmarks, from the Grand Canyon to the Great Wall of China. The levels are largely excellent, but occasionally, I hit what seemed like a loading hitch where my racer and the level halted, and then resumed mere seconds later—the first time this happened it made me think, « well, maybe I’m too fast for the level to load in. » The reality was the levels that have more chaotic happenings in the background chug ever so slightly sometimes. In the late game, say over level 50 or so, unlocking new levels slows to a halt. Often, I’ve found myself racing through all the new league’s levels, only to find myself with an eight-or-more level gap to unlock the stadium to finish up the league and unlock new races. The grind to get to those levels is long, with Contracts being essential because they give you more Fame than just chasing high scores alone. Yet at the time of this grind, the Contracts have now become even more difficult to overcome. I imagine for some players, it might take quite some time to see everything Trials Rising has to offer. One new annoyance is something that’s been inevitable: microtransactions. The loot boxes and microtransactions in Trials Rising are omnipresent. Every time you level up, you get a loot box to open up. If you take on the Challenger Mode, which unlocks at level 24, and successfully beat the other ghost players within your limited three chances, you’re rewarded with special « Challenger Crates. » It all feeds into Trials Rising’s new focus: customization. 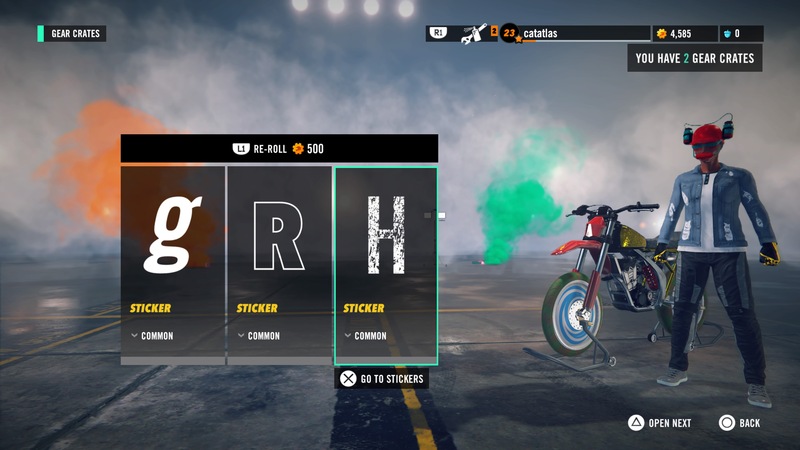 On most parts of a bike (and cosmetic items for your character), you can slap 200 stickers on it. So if you want your bike to be a rusty red that looks akin to Kaneda’s bike from Akira, you can do your darndest. In most loot boxes, I was opening up lots of cosmetic duplicates that you can « sell » for additional Trials Coins. With Trials Coins, you can eventually build out your bike library with two additional novelty bikes; the total amount of bikes in the game are six, starting you off with the Squid, with the other three unlocking as you progress. I’ve only been able to buy one so far, as they’re very expensive. With microtransactions, you can always just buy them outright with the Acorn currency. (Acorns can also be earned in-game by finding collectibles in levels and participating in the seasons of global multiplayer.) I saved up 15,000 Trials Coins through my blood, sweat, and tears, and around level 40 I bought the Donkey—an adorable scooter that is actually hellish to ride. It’s fitting that for the new Contracts that unlocked after getting the bike, the goal is simply to « finish » the track while riding the Donkey. Somehow, the Donkey isn’t even the most unwieldy bike in the game, for a series known for its tilt-sensitive motorbikes. That honor goes to the new Tandem bike, which is a new co-op-enabled motorbike where two local players control the same bike. The same bike. It’s just as much of a nightmare as it sounds. I tested it out with my partner, and soon we found ourselves laughing and swearing at one another for fudging up jumps, or popping too vertical of a wheelie on accident. It’s a bike that requires you both to work together verbally, to ensure you’re on the same page with whatever a level throws at you. The Tandem bike is playable on any level too, so it’s not relegated to its own offbeat mode or anything. If you want, you can literally play the entirety of Trials Rising with a buddy at your side, but I have no idea why you’d inflict such pain on yourself. Online multiplayer, and generally interacting with other players, is the new center of Trials Rising. In launching the game, I’ve been constantly taunted by peers in the industry that I’m friends with on PSN who are also on Trials review duty and are demolishing my scores time and time again. On the world map itself, you’ll see pop-ups of new high scores from other players. In the weeks to come, Ubisoft and RedLynx are prepping a three-month-long seasonal structure for multiplayer with new goodies in tow, and two DLC packs. The global multiplayer itself, from what I played of it in this past weekend’s open beta, was stable. Matchmaking happened within a minute every time, and racing against ghosts never hit any particular issues. For Trials Rising’s big push towards social gimmicks and multiplayer, it working well is a good sign for its longevity. Another new addition comes in the University of Trials, which is essentially an ongoing tutorial teaching you specific techniques in Trials. As someone who only got into the series with Fusion, I’ve found it remarkably helpful (even if I still can’t quite land bunny hops right). The tutorial missions, in addition to other events like Skill Games (where levels have very specific goals, like how far you can last if you have no brakes and constant throttle), are gated by levels. 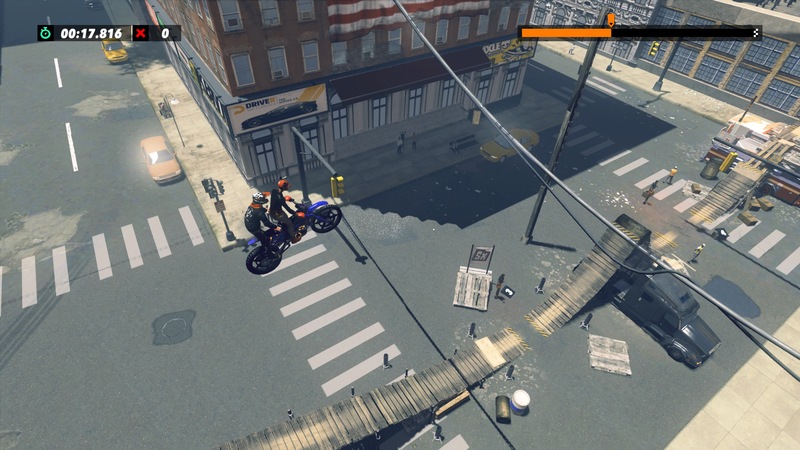 Essentially, the harder Trials Rising gets, the trickier moves tutorials begin to teach you. It’s a smart way of rolling it out, never overwhelming you with intimidating skills from the outset and teaching you more as you become a master of the basics. Even with frustrations in late level gating, the tedious world map design in place of an easy to navigate menu, and those pesky microtransactions with duplicate-heavy loot boxes, when I’m behind the wheel at the start of a course, Trials Rising is just as thrilling as the Trials series has always been. When it comes to the base game, there’s plenty to keep players chasing those high scores and completing additional Contracts. As for me, I’m happy with my mostly-silver medals forever. Trials Rising adds a layer of annoyance on top of its already-winning formula, with its clunky world map and tedious level gating. Luckily, beneath that exterior it’s just as electrifying as it’s always been. The tracks are all a joy to race through as you chase landing on the leaderboard or overcoming tough Contracts. With its international approach and attention to detail, each level’s design—from an art and gameplay perspective—feels like the best Trials has ever been. Next PostSamsung Galaxy S10 : où le trouver au meilleur prix ?